The field of 18 drivers has attracted some of the best AMCA pilots around including the likes of former Australian Champions Tim Reidy (2017) and Jeremy Moore (2018) and current Australia #4 Shane Cartwright. Then when you throw in current SA Champ Dean Heseltine, Tasmanian Rob Bassett, Darren McCarthy, Jason Robinson, Lachie Gwynne and Jake Armstrong it will be an extremely hard-fought Championship event. The Wingless Sprints return for the second week in a row with another strong line-up including Australian Champion Joel Chadwick who will be chasing his fourth feature race in a row. Matthew Kennedy gave Chadwick a real hurry up last weekend and he will be hoping to go one spot better this Saturday night. Joel Heinrich steps back into the Wingless after making his 410 Sprintcar debut recently and he will be another serious contender along with Jake Ashworth, Robert Heard, Jarman Dalitz, Brad Evans and Darryl Sloan. A field of 9 Late Models will back up for another week with last Saturday’s winner Mark McCarthy among the field that also includes Mat Crimmins, Fiona Verhoeven, Andy Maxwell Jr and Jason Robinson. It is also great to see Steve Vaughan is set to return to action after rolling his machine last weekend in the opening heat. The Modlites and Street Stocks will also be present in good numbers taking the event nomination list to over 70 competitors, therefore it should be a great night of racing from a wide variety of Speedway classes. 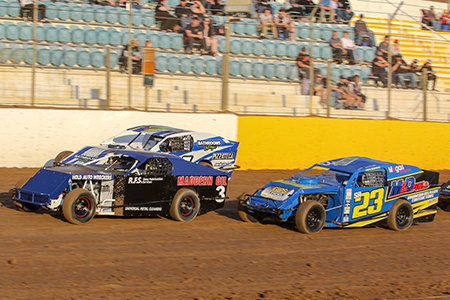 Event Details – South Australian AMCA National Championship, Late Models, Wingless Sprints, Modlites and Street Stocks – February 9, 2019.